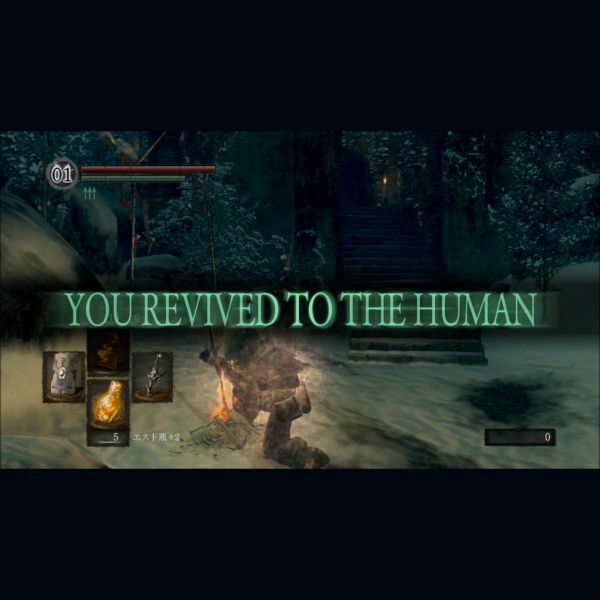 Game companies release remakes and ports all the time. Some put a lot of effort into their re-releases, while others go with the easy cash-grab approach that results in sloppy translation problems. Since this is a topic that I keep referring to lately, I thought I’d start a list of examples of this phenomenon in action. I’ve only gathered a handful of examples from Square Enix ports for now, but if you know of any other examples, let me know in the comments. Square Enix is one of the most well known offenders in this category, although they’re probably not the worst. Square Enix mobile and PC ports tend to feel sloppy all around for some reason, and they almost always have obvious text and translation issues right off the bat. Golbez's name is actually "Golbeza" in Japanese (more info here), but it's been shortened to "Golbez" ever since the first Final Fantasy IV translation in 1991. 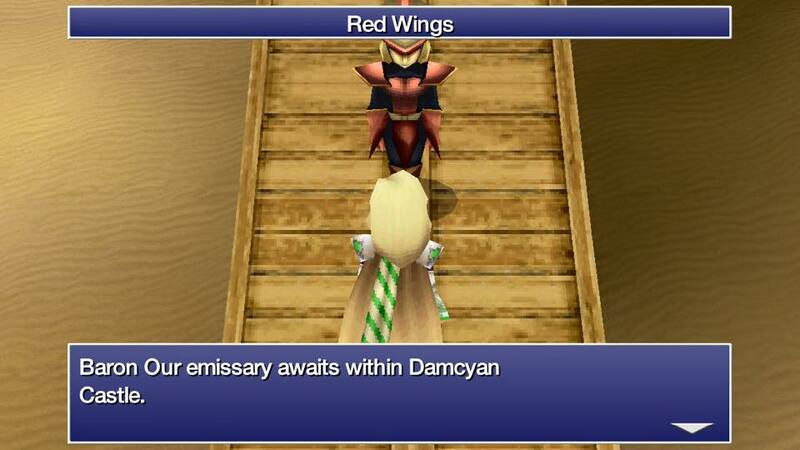 Someone didn't tell the people working on the mobile port of Final Fantasy IV: The After Years though. The game had already been translated before, so how did this happen? The After Years featured other weird mistakes like this stray word appearing in a line of text for no reason. The translation seems to have come from previous translations of the game [example], yet new mistakes like this wound up in the game somehow. 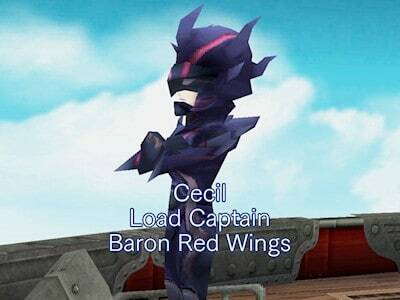 The mobile port of Final Fantasy IV featured "Load" when it should've been "Lord", but this wasn't a standard Japanese-to-English "or" mistake. What's more, this is the very first piece of text in the game - how did no one notice this mistake? And how did it happen? It was perfectly correct in the DS translation! 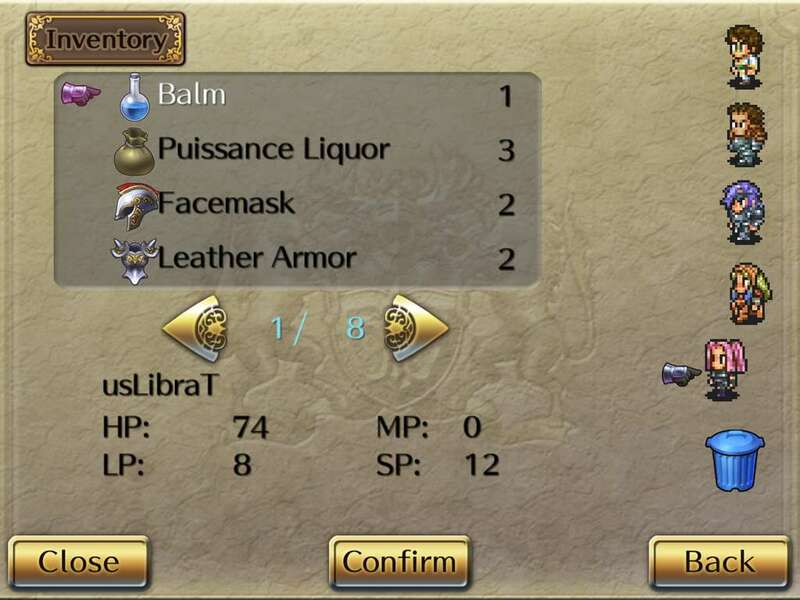 The Dragon Quest series has earned Square Enix billions of dollars... yet the mobile port guys couldn't even spell the name right. 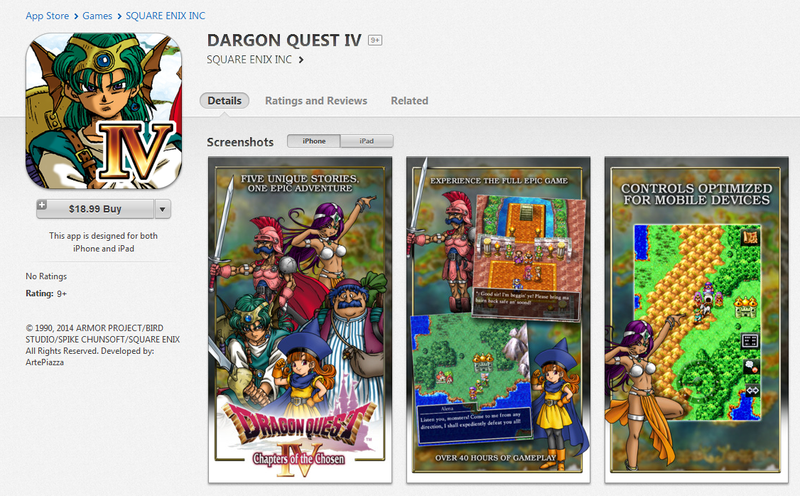 As a result, if you searched for "Dragon Quest IV" when it was released, you'd find nothing! 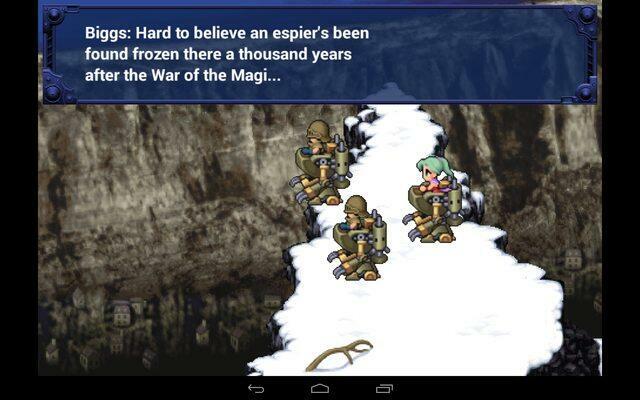 The very second line of text in the mobile port of Final Fantasy VI misspelled "Esper" as "espier". Espers are at the heart of the game's story, so it's baffling how this mistake happened, especially since the mobile port seems to use a pre-existing translation. 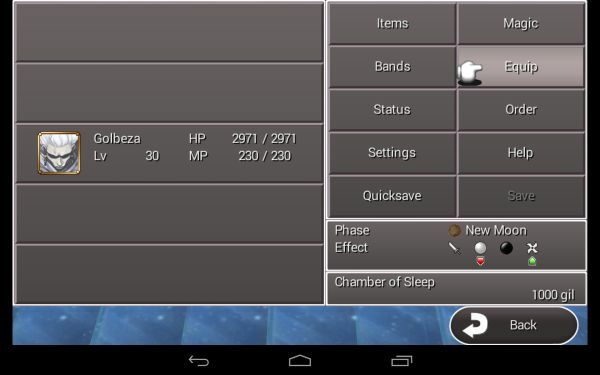 The PC version of Chrono Trigger is simply a port of the mobile version of the game, which itself was a port. 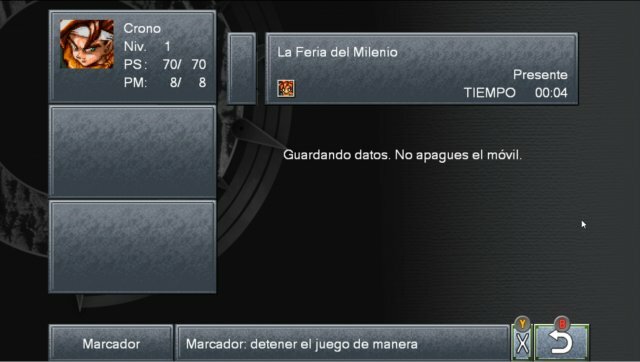 In this pic from the Spanish release, the translators forgot to change the "Don't turn off your phone" message when saving. I was late to the party, so I don't know if this appeared in the English version too, but it's at least been patched now. A dumb mistake or two is understandable once in a while – we’re all human. But problems like these have become common enough in Square Enix ports that it’s almost expected every time they release a new one. The problems usually get patched eventually, but how do they happen to begin with? I have a theory: I assume that many of these ports are cheaply outsourced to other companies to handle, and that for some reason a lot of the text has to be manually re-typed by hand. The DS version from 2007 featured a complete retranslation. Here, we see the word "Leave" used. 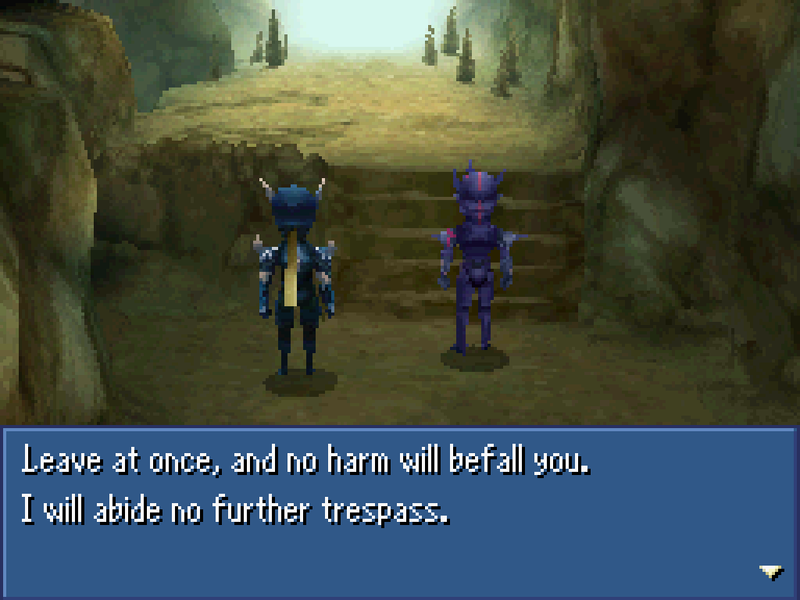 The mobile version uses the DS translation. In this version featuring all the latest update patches, the script still says "Leave" here. The PC version is a port of the mobile version, including the weird user interface and all. Here, we see that it's been misspelled as "Leve" for some reason. This might also explain how the “Load Captain”, “espier”, and “Baron Our emissary” mistakes happened in the examples above. I plan to update this list from time to time, so if you spot any other examples from any company that would fit here, let me know. They don’t even have to be Square Enix games – I’m genuinely curious about how this happens across the industry! It’s hard to believe that they haven’t created standardized text insertion tools and databases. After the initial investment, which could have been as long ago as Final Fantasy VII in terms of technology practicality, such a thing would have saved untold amounts of money in QA. Maybe it does exist but Square-Enix considers it to be a trade secret and won’t let the outsourced companies touch it. Or maybe the the company is so bloated and bureaucratic that retyping is faster than getting approval or finding the left hand to talk to the right hand. In any case, I can’t think of anything worse than having to manually re-enter every line of text for every language every time there is a new port. One of these days, a pointer will be skipped and frustrated, career-ending translator comments will slip into the dialogue. Having done a lot of re-translations of Japanese IPs I can vouch for the fact that companies often misplace things/lose things over time so you have to redo things from mostly scratch sometimes. It does seem pretty sloppy for that to happen this often though. I was thinking that by now there’d exist something like “Square-Enix Markup Language” and that every new game or new port of an old game would have this API baked in. This hypothetical API would enumerate at least all the dialog text, if not also items, monsters, menus, etc. 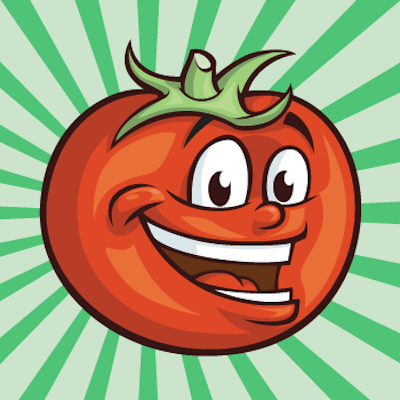 and could draw entries from an existing database or a specifically formatted spreadsheet. It would be hard to lose because it would be a universally applied, monolithic system. Something like this would also make generating scripts for voice actors very easy and would avoid those awkward moments when the localizers clearly missed giving the actors a line here and there. I do understand losing assets for the really old stuff. Even if tools still do exist, they might be written in assembly or non-portable C for, say, a 1990s MIPS or SGI workstation. 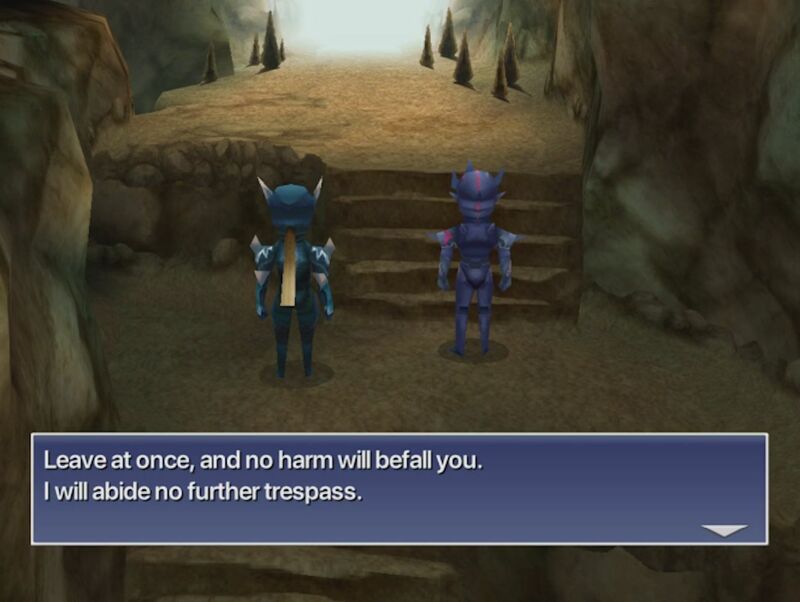 As an example of the exact opposite, the PC port of Final Fantasy 7 got another editing pass that cleaned up a LOT of the awful grammar and clunky lines in the original translation. This script got reused for the later Steam release as well. It wasn’t necessarily that the old PC port was bad (MIDI-fied music aside), but the game was built for the PlayStation, so it feels a bit off on PC. The only real problem I had with it back in the day was that the various controller-centric minigames often mapped strangely to the keyboard. I remember having a heck of a time coping with the piano in particular. The FF6 “port” doesn’t just use the GBA script: It IS the GBA game, just in a really weird emulator (Seriously, look it up). That just raises further questions on how they screwed it up. Oh yeah, I forgot! I was under the impression that it used the original ROM data for things like enemy stats and actions, but I can completely understand if they used it for the gameplay scripting stuff too. In which case my theory for FF6 (and maybe FF4) is this: the original game’s scripting language says “Display Script Line 30”, but they decided to put all the script lines in a new, external file for easier handling, replacing, editing, and multi-region localization stuff. Rather than do technical work to dump all the original text out of the ROM they had some intern or someone just type everything in by hand instead, which introduced new errors. Haha, I forgot about all those stories that the iOS Ace Attorneys wound up filled with problems. That’s definitely an interesting angle to look into, thanks for the pics! Regarding the stray word appearing on its own line, I’m inclined to believe this has to do with manual word wrapping. Japanese games don’t do automatic word wrapping (because neither the language or the writing system work in a way where that makes sense, not to mention being virtually impossible to implement) and just breaks the line at whatever character would cause the line to go beyond the bounds of its container. In addition, every character has the same width, so the width of a line is often just measured by counting the number of characters. Because of this, things like automatic word wrapping and taking the varying widths of characters into consideration are often not implemented. This means that if such a game gets translated to a language that does need those things, either that functionality needs to be added to the game or line breaks need to be added manually into the script. No doubt a depressing amount of times the latter option was chosen. The obvious problem with this is that if the width of the message box changes, for example because of a switch from a 4:3 aspect ratio to 16:9 one, all of the entries in the script have to be redone. This makes it easy for issues like this to crop up, especially if they tried to reduce their workload by not checking entries that have fewer than some number of letters. Alternative possibility: the game does do automatic word wrapping, but still assumes that all characters are the same width. So if a script entry has a lot of narrow letters like ‘i’ and ‘j’, it can trigger the line break prematurely. This doesn’t appear to be the case here, though. It appears someone accidentally left ” Soldier:” out, or some sort of name tag problem happened instead. I haven’t looked at how the game’s programming so I’m not sure which one it is, but my bet is it’s the former. 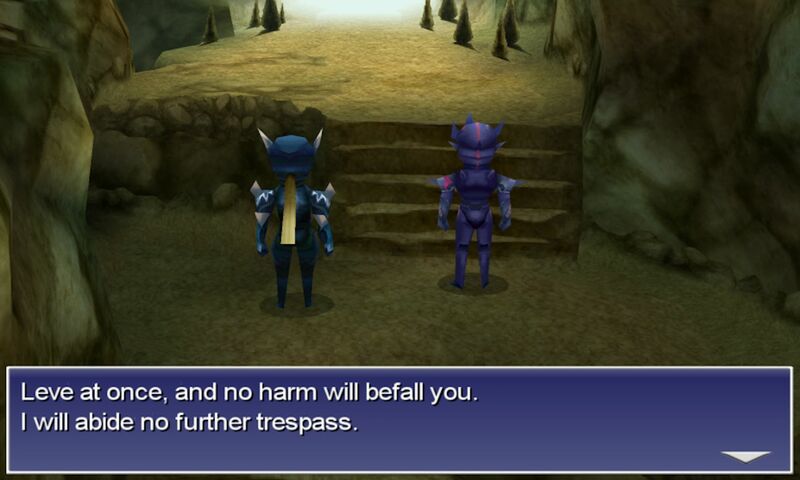 I suppose you have a bit more experience with word-wrapping than most, but your previous FFIV analyses have shown that the game doesn’t automatically word-wrap anyway. So it’s probably just a straight accidental removal of that one word. Messing up the title of the best Dragon Quest entry (my opinion) is a freaking affront. Damn it Square, get your goddamn act together!